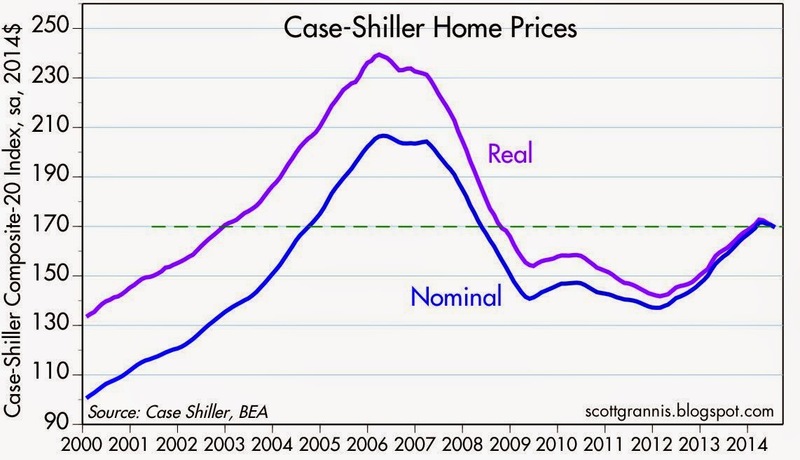 Case-Shiller also reports a series of housing prices in 10 major metropolitan areas which extends back to 1987. 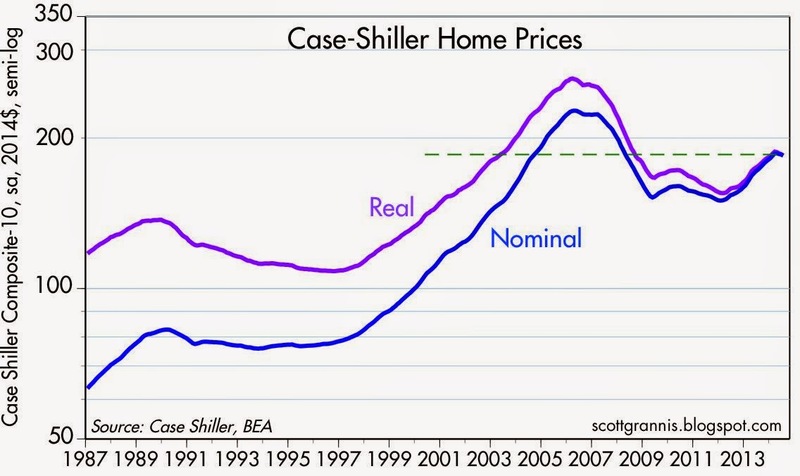 Here we see that real home prices have only increased at an annualized pace of 1.7% in the past 27 years, and prices today, in real terms, are about the same as they were in 2002. 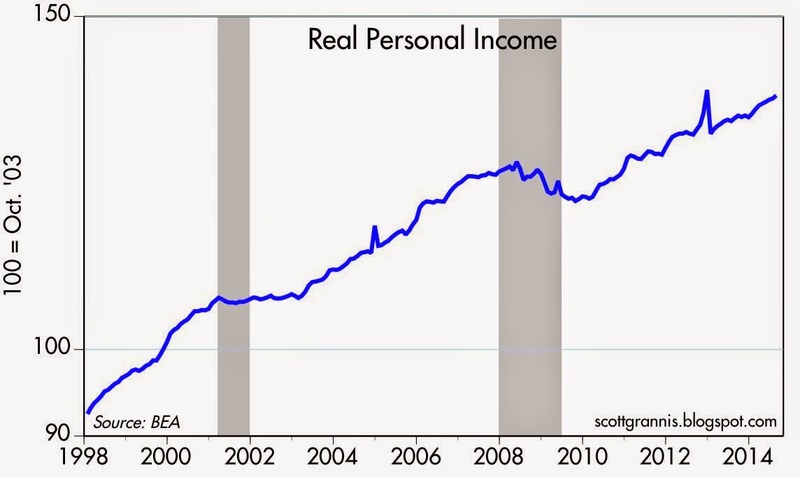 Real incomes, in contrast, are up at a 2.7% annualized pace over the same period. 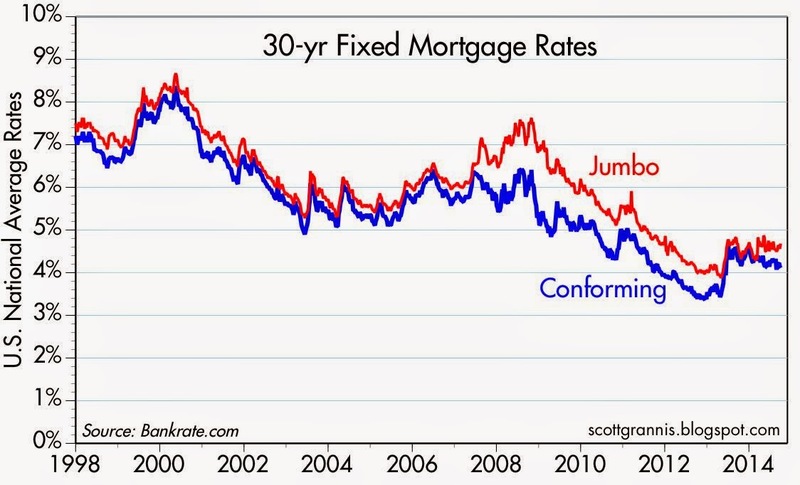 Couple that with the fact that mortgage rates today are 4-4.5%, whereas they were twice as high in 1987, and you find that housing prices are much more affordable these days. It's a good thing that the housing market has cooled off somewhat, since that will give folks like my daughter and her husband a chance to search for and bid on a home in a less-frenetic atmosphere. They were beginning to think that they had missed the affordable-housing train. The first of the above two charts compares the increase in housing prices since 1987 with the increased cost of renting a home ("homeowner's equivalent rent," which gets a weighting of about 25% in the Consumer Price Index). Home prices have only slightly outpaced the increase in rents in the past quarter-century. 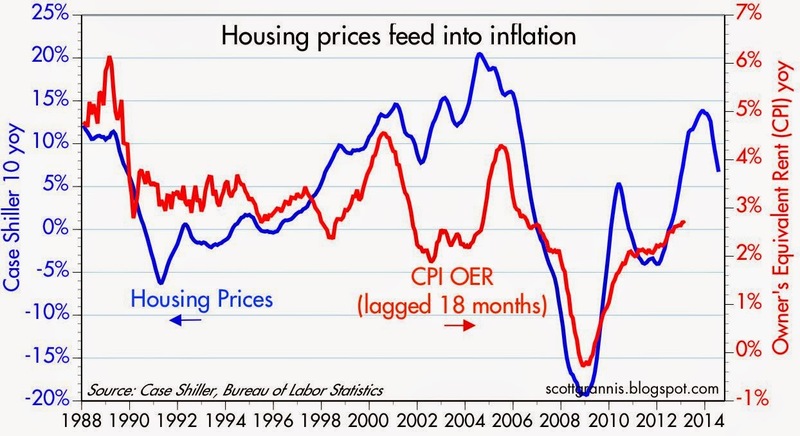 The second chart shows how the rise in home prices tends to feed into the calculation of the CPI with a lag of about 18 months. The recent pause and decline in prices is likely going to moderate the rise of the CPI over the next year or so. Real estate is a lagging indicator. The stock market bottomed in the first quarter of 2009. Real estate sometime in 2011 (various components earlier or later). The stock market retrenched somewhat in 2011, two years after the 2009 bottom. This real estate downtick/price retrenchment seems to be analagous to the 2011 stock price correction. I agree, nothing to see here. The yield curve remains strongly positive. A survey of commercial real estate exec's and brokers here in Texas conclude (forecast) that the real estate expansion (in this state, at least--DFW, Austin/San Antonio, Houston) has 30 to 36 months to run (from an August, 2014 survey). Another great post. My wife and I find ourselves in a similar situation as your daughter and her husband. 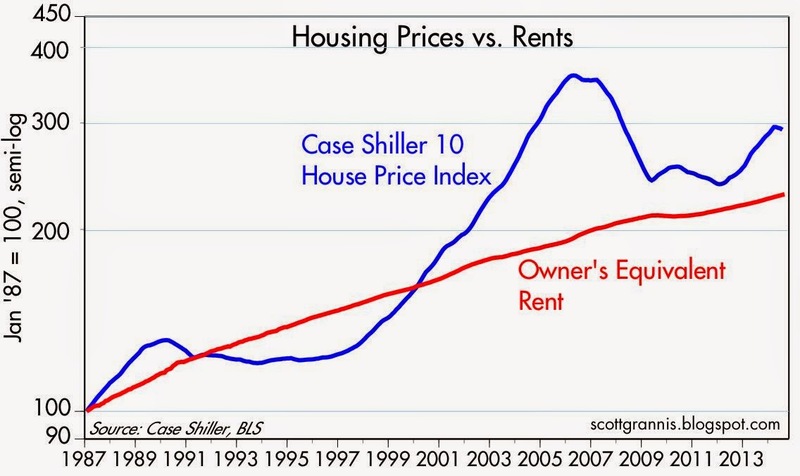 Given the housing price vs rent chart, it appears that now is a good time to buy. With that said, things become much trickier when you look at San Mateo (and the rest of Silicon Valley). Can you recommend a tool to figure out what the housing price chart to rent ratio would look like for the Peninsula (NorCal Bay Area)? My gut tells me that we may be better off renting until the next housing crash due to the uniqueness that is the Bay Area real estate market. On the other hand, prices continue to rise in nice areas and this may be a good time to become first time home buyers. The Fed has been tightening up, cuttibg QE, despite never even reaching its average PCE inflation target of 2 percent. Lots of signals going soft. Property and equities fully valued now, market knows it. If you can figure out how to make money in a very slow growth economy, please post a note here. Benjamin Cole said..."If you can figure out how to make money in a very slow growth economy, please post a note here." That is rich Benjamin coming from you. For years, Scott Grannis has not only written excellent analyses of economic and market data but also has been generous in making recommendations for asset allocations. Maybe "Benjamin" should have paid more attention to Scott's blog posts rather than rushing to repeat your own remarks here on almost a daily basis. Taking a note out of Warren Buffet's playbook. The best way to increase personal revenues during a "slow growth economy" is to dollar cost average into an index fund of the S&P (low management fees). After putting that on auto-pilot Buffet suggests working on your personal craft to become world class at what you do. World class performers in almost all fields can demand higher pay (imo this is the most reliable way to growing wealth). As far as dollar cost averaging into the S&P 500, here's historical data (see link) that proves it's the best investment over time (even more so when you factor in low management fees compared to mutual funds). Keep in mind, Scott recently mentioned that investing in a REIT index or ETF was a better call than the S&P 500 for the short to medium term.